CLICK HERE to go to a book review. There is a formidable presence in one of the galleries at the Brattleboro Museum & Art Center. It is like entering an archaeological dig -- a resurrection of an ancient ruin. Is it Celtic? Are there hidden meanings in each stone balanced in the round celestial body of stone? Is the wall marking the corner of a 19th century shepherd's field, each stone harvested painstakingly from rocky New England soil? Standing like artifacts of long-ago civilizations, the wall and stupa are the artful stonework of Dan Snow, a master drystone waller of Dummerston. He follows in the footsteps of generations of stone wall builders -- from the Italian stone masons who came to Vermont to chisel tombstones and build house foundations, retaining walls and entire buildings -- to the sheep farmers of the 1800s marking boundaries with ledge and stone, enclosing their flocks of sheep with stone walls. In this exhibit entitled "Dan Snow: In the Future of an Imagined Past," we are reminded of our human history: living in caves, building towers and bridges, constructing walls for shelter and protection. All the while beauty and art creeps into the arduous task of piling rock upon endless rock. Today Snow's stone forms create sanctuary from a hectic world -- a waterfall, a garden wall, a border, at the corner of a barn. The spirit contained in the gallery is dense and protective from the energy stored in the mass of granite. Snow's artwork anchors the room like a ship, the stone breathing out the memory of moss and quarries, the compressed energy of planetary time. The stonework represents eons of geological shifts in the earth's mantle with its tedium of glacial stretching. The presence of the stone structures transforms the room into sacred space, the stupa and wall informing the viewer of the nature of stone held within the silent power of its mass. In Snow's book In the Company of Stone, he notes the fact that "there is a ton of stone in every yard of drystone wall three feet high." One can sense the weightiness of the structures, the elephantine bodies of each form cloistered in the Museum's old railroad station, itself a beautiful example of master stonework. Snow's stupa structure reflects the Tibetan tradition of marking the burial remains of great spiritual leaders on the vast plateaus of a mountainous country. The stupa evokes a bee hive laboriously curved as the stones are piled and balanced. It is a vessel of mysterious roundness, perfect in its cylindrical symmetry. Since 1976, Snow has built walls with his bare hands and often with little more than a hammer, rope and a crowbar for leverage. More than the practicality of retaining walls, borders, garden paths or dams for wayward waterways, his art speaks through the stubborn medium of stone with beauty and grace. as shown in the garden above. Snow's relationship to stone runs intimate and deep. Working alone he finds the "independent spirit" of the stone is something he has to manage. He respects its ability to crush him or blind him. He wears protective glasses and is mindful of the urge for weighty stone to fall. It is a marvel to think of one person methodically taming a pile of rocks into a spirited structure exuding all the elements of protectiveness, beauty and sacred form. As he notes, "to begin walling is to acknowledge the power held by stone. Every stone, whatever its size, has the potential to raise the wall up or bring the waller down." The stone waller becomes a midwife birthing the stones from the thick slabs of ledge. With steady hands, he creates rocky offspring with which to compose his borders, pathways and arches. Snow notes, "I detect weakness in the stone's structure with the first hammer blow, then exploit it with subsequent hits until a seam opens and the stone pops apart." With this act of unleashing new stones into the world, he bridges the gap between the present and centuries of the Earth's mountain-making. As in any sculpture or art piece, the negative space is as important as positive space in stone walling. Snow must balance rock against rock in a tightly knitted composition with forethought and patience. Each stone is placed with the whole in mind, and each stone relating to its companion stone holding one another in balance. A former sculpture student, Snow incorporates an artistic flair within the traditional and practical task of building stone walls. He has earned certification in the prestigious Dry Stone Walling Association of Great Britain, a rare honor for an American. 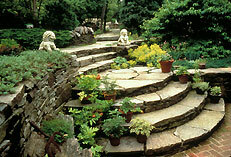 His work has appeared in many publications including This Old House, Garden Design, and American Nurseryman. His book In the Company of Stone: The Art of the Stone Wall was published in 2001. Snow's book contains gems of gentle stone wisdom from a lifetime of quiet rapport with his craft. The often luminous photographs by Peter Mauss accompany the personal and poetic text explaining the artist's place within the act of stone wall building: "The handling of stone sets me squarely between imagining and knowing." It is this interim place where the stone invites the drystone waller to art make, and gives Snow his creative power to transform the traditional. Snow creates a sense of ruin, the old rising from the earth. In his modern rendering of stone walls, pathways, grottos and waterfalls there is a sense of timelessness and the compression of eternity. 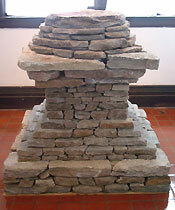 The stone artistry of Dan Snow can be viewed at the Brattleboro Museum & Art Center until December 31. Hours are 12 to 6 pm, Tuesday through Sunday. For more information, call the BMAC at (802) 257-0124.